I’m going to write about a field, a marshy field. You may have a vision of elderly English people who retire abroad, dreamily sipping white wine by their swimming pools on hot summer evenings, as they prepare to tuck into the foie gras and the goat’s cheese. My expat idyll is very different: I spend my afternoons in wild places, studying the butterflies and wild flowers of the Aveyron, one of the most remote parts of deepest France. In my last article for The Vintage Magazine, I described the joys and pains of selling my photos in our village market. Here I’m going to write about a place, a field, a marshy field, where I took all the photos in this article. 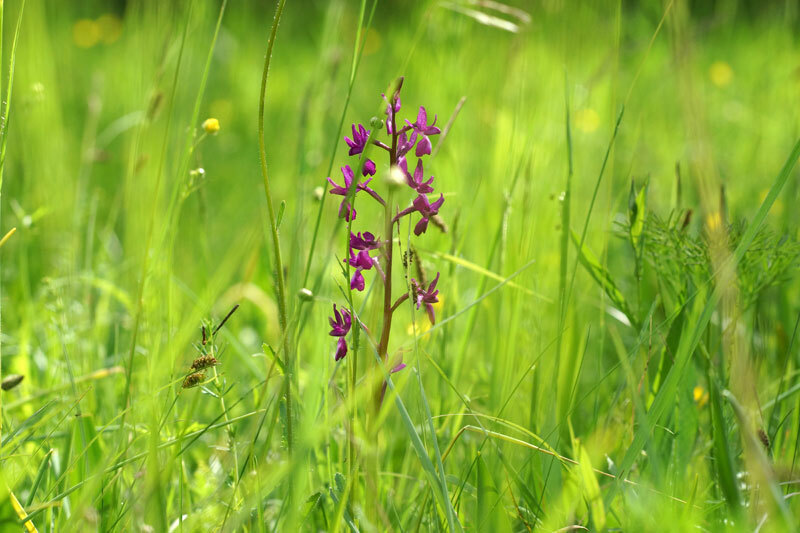 Most of the orchids I find like dry alkaline soil; I spend much time in the causse, the dry limestone rough sheep pasture, off to the west of the village. But at the end of May 2009, I found a marsh. To say that I found it is an overstatement; I was taken there by Madame Tirelli, a local botanist. Madame Tirelli is famous for finding the Ail de Sicile, the Sicilian Honey Lily, Nectaroscordum siculum, marked with five Rs in my books, denoting extreme rarity. The Ail de Sicile can be seen on my site www.orchideesdenajac.fr under Other Flowers, for late May most years. It occurs in the wild in only a few other sites in France. It’s a spectacular cultivated garden flower in England, and when I’m taken to Glyndbourne, I make a point of finding it in the borders. English specialists who come to see me to find a particular plant or butterfly are often surprised at the casual modesty of my sites. 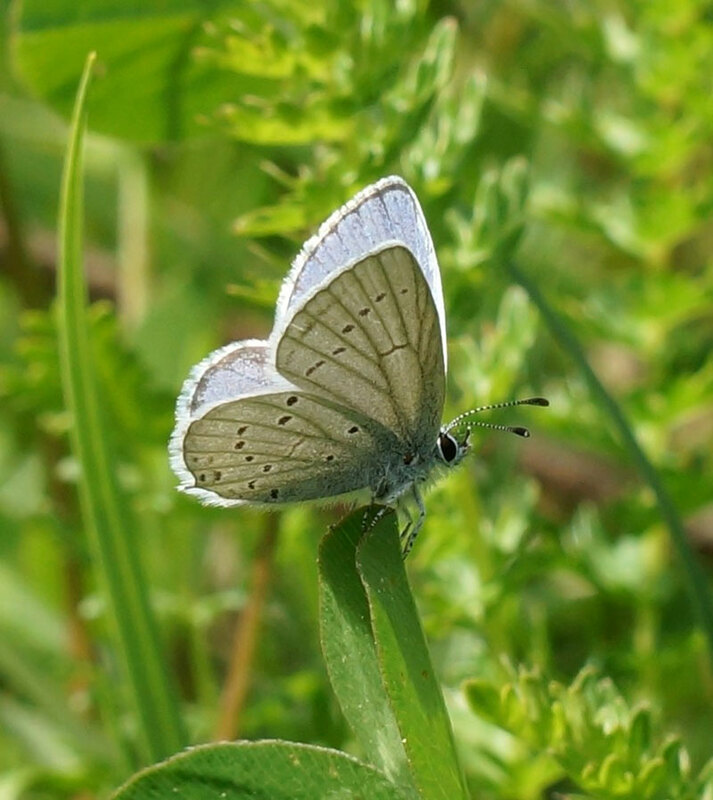 One came out to see the Large Blue butterfly, intriguing because of its symbiotic relationship with red ants. We went to the small corner of overgrown wood where I usually find it, rich in abandoned rusting agricultural machinery, and mounds of cut Hawthorn, placed in the paths by the farmer, to discourage the local boys on trail bikes. We found the butterfly. ‘What are you doing to preserve this remarkable habitat?’ the expert asked me as he leant against what was left of a tractor. ‘Shouldn’t it be a Site of Special Scientific Interest?’ This is an example of what I call ‘London thinking’. In rural France the best way of allowing something to continue to be a site of scientific interest is to tell nobody about it at all, a policy I follow with great energy. Madame Tirelli had been talking to me about this marsh for some time, but it was not until the 27th May 2009 that we made our first visit. 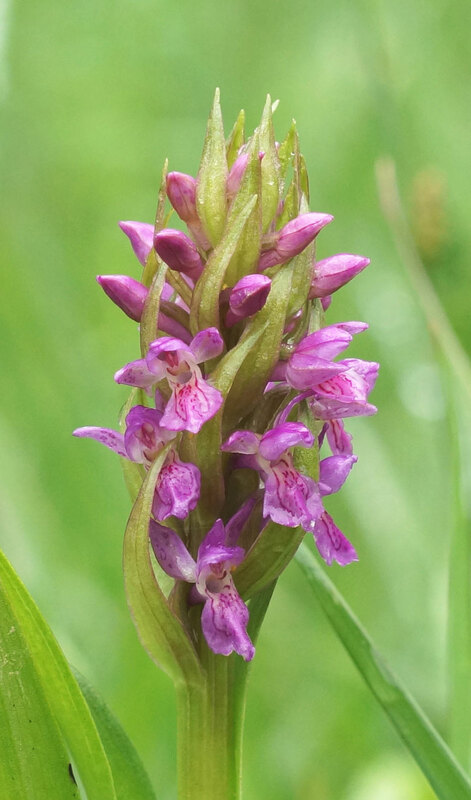 The approaches were promisingly rough, a stony path with a young stream running down the centre, a few scrawny Dyers’ Greenweed, a sort of dwarf broom, and the occasional Military Orchid on the eroded hillside. Then the plunge down into the valley: immediately we found the buttercups and clovers harbouring a butterfly I’d never found before, the exotic and beautiful Marsh Fritillary, which depends on the Devil’s-bit scabious as its larval food plant – the French, inclined to name butterflies after their associated plants, call it the Damier de la Succise, the Scabious Fritillary. This exciting discovery was followed by others, the Duke of Burgundy, and the Provencal Short-tailed Blue – three new butterfly species for me in one afternoon. But we found three new orchids too, lovers of wet places, the deep-red Loose-flowered Orchid, the Early Marsh Orchid, whose French name, incarnat, evokes its flesh-coloured flowers, and the extraordinary Robust Marsh Orchid, elata, the deep-purple spikes five feet tall and as thick as a wrestler’s thigh. I went back of course, and watched the flowers develop all the summer through, and I went back the next year, 2010, as well, and I found the lovely dark-brown Sooty Copper, perching on the budding dropworts. I never went without finding a great variety of plants and butterflies which I didn’t meet elsewhere. Then 8th May, 2011, DESOLATION! The farmer had activated the electric fence; cows were all over the marsh, and mechanical diggers were pulling up many of the larger willows. They had turned my marsh into a muddy mess. An English friend visiting suggested I try to approach the local authority, and have them declare a preservation order. More ‘London thinking’. We naturalists in far-flung places have to live with the agricultural community, who regard our activities with astonishment and incomprehension. Cows will have been grazing the marsh for hundreds of years; they will enrich and aerate the soil. But the desolation continued; 2012 and 2013 were just as bad: no marsh orchids, no butterflies, no dropwort. Then this year, 5th May 2014, I went again, fearing the worst. But JOY! No electric fence, no cows; and the Marsh Fritillaries and the orchids were back, back and just budding. My marsh was knee deep in buttercups and knapweed and dropwort, all covered in freshly-hatched blue butterflies and fritillaries. I got many photos which pleased me and which can be seen on my site. So you see, you were right to say to yourself, that this was like one of those Hollywood movies, where you know you mustn’t worry because things will work out fine in the end. Except that when I returned just ten days later, on 15th May 2014, the fence was up again; the cows were back and the marsh was grazed down to my ankles. We naturalists in far-flung places have to live with the agricultural community. Cows will have been grazing the marsh for hundreds of years; they will enrich and aerate the soil. 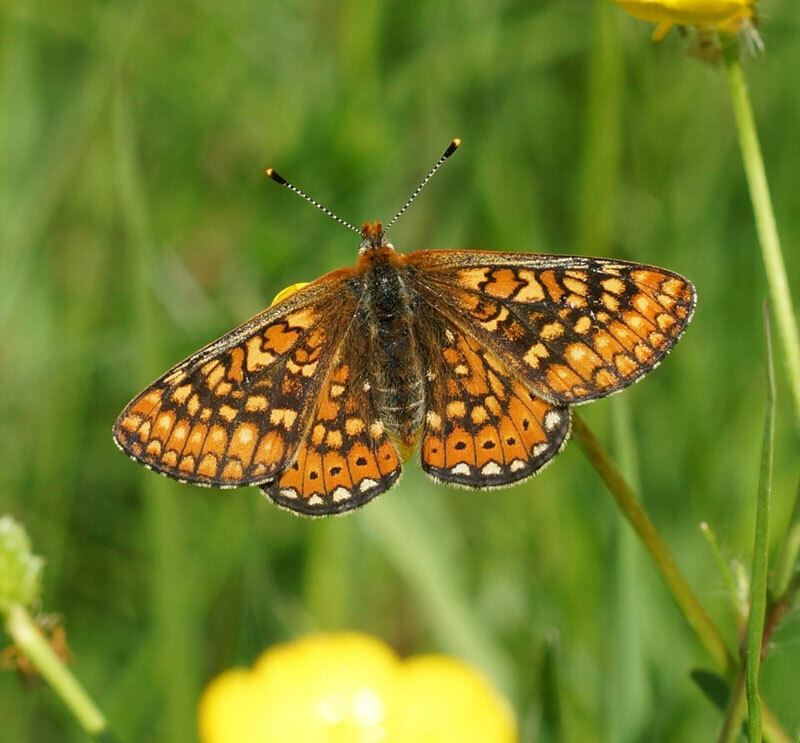 They will create an environment for the Loose-flowered Orchid, the Duke of Burgundy, the Marsh Fritillary, the Provencal Short-tailed Blue, and all those other wonders. But not just yet. Michael Fontes taught at Winchester College between 1966 and 2002. He was Head of Economics and a housemaster. He retired to Najac, Aveyron, France, and now runs Les Orchidées de Najac, a small business through which he sells his photos of the flowers and butterflies of the area.